Life takes strange turns. I’m connected to the ed-tech world by way of Gardner Campbell, Jim Groom, and Mike Caulfield. They are fierce critics of the academy’s embrace of the Learning Management System (LMS) and are among the leaders of an indie-web movement that arose in opposition to it. So it was odd to find myself working on an app that would enable my company’s product, the Hypothes.is web/PDF annotator, to plug into what’s become the leading LMS, Instructure’s Canvas. I’m not an educator, and I haven’t been a student since long before the advent of the LMS, so my only knowledge of it was second-hand. Now I can report a first-hand experience, albeit that of a developer building an LMS app, not that of a student or a teacher. What I learned surprised me in a couple of ways. I’ve found Canvas to be less draconian than I’d been led to expect. More broadly, the LMS ecosystem that’s emerged — based on a standard called Learning Tools Interoperability (LTI), now supported by all the LMS systems — led me to an insight about how the same approach could help unify the emerging ecosystem of annotation systems. Even more broadly, all this has prompted me to reflect on how the modern web platform is both more standardized and more balkanized than ever before. Working out how to do that was a challenge. But with lots of help from ed-tech friends and associates as well as from Instructure, we came up with a nice solution. A teacher who wants to base an assignment on group annotation of a PDF file or a web page adds our LTI app to a course. The app displays a list of the PDFs in the Files area of the course. The teacher selects one of those, or provides the URL of a web page to annotate, then completes the assignment in the usual way by adding a description, setting a date, and defining the grading method if participation will be graded. When the student clicks the assignment link, the PDF or web page shows up in a Canvas page with the Hypothes.is annotator active. The student logs into Hypothes.is, switches to a Hypothes.is private group (if the teacher created one for the course), engages with the document and with other students in the annotation layer, and at some point submits the assignment. What the teacher sees then, in a Canvas tool called Speed Grader, on a per-student basis, is an export of document-linked conversation threads involving that student. The documents that host those conversations can live anywhere on the web. And the conversations are wide open too. Does the teacher engage with students? Do students engage with one another? Does conversation address predefined questions or happen organically? Do tag conventions govern how annotations cluster within or across documents? Nothing in Hypothes.is dictates any such policies, and nothing in Canvas does either. Maybe the LMS distorts or impedes learning, I don’t know, I’m not an educator. What I can say is that, from my perspective, Canvas just looks like a content management system that brings groups and documents together in a particular context called a course. That context can be enhanced by external tools, like ours, that enable interaction not only among those groups and documents but also globally. A course might formally enroll a small group of students, but as independent Hypothes.is users they can also interact DS106-style with Hypothes.is users and groups anywhere. The teacher can focus on conversations that involve enrolled students, or zoom out to consider a wider scope. To me, at least, this doesn’t feel like a walled garden. And I credit LTI for that. Why did I need to be reminded? Because while the web’s foundation is stronger than ever, the layers being built on it — so-called frameworks, with names like Angular and Ember (in the browser), Rails and Pyramid (on the server) — are the province of experts. These frameworks help with common tasks — identifying users, managing interaction with them, storing their data — so developers can focus on what their apps do specially. That’s a good and necessary thing when the software is complex, and when it’s written by people who build complex software for a living. If I had to write a Canvas plugin I’d have needed to learn a fair bit about its framework, called Rails, and about Ruby, the language in which that framework is written. And that hard-won knowledge would not have transferred to another LMS built on a different framework and written in a different language. Happily LTI spared me from that fate. I didn’t need to learn that stuff. When our app moves to another LMS it’ll need to know how to pull PDF files out of that other system. And that other system might not yet support all the LTI machinery required for two-way communication. But assuming it does, the app will do exactly what it does now — launch in response to an “API call” (aka URL), deliver a “component” (an annotation-enabled document) — in exactly the same way. All this brings me back to Hypothes.is, and to the annotation ecosystem that we envision, promote, and expect to participate in. The W3C Web Annotation Working Group is defining standard ways to represent and exchange annotations, so that different kinds of annotation clients and servers can work together as do different kinds of email clients and email servers, or browsers and web servers. Because Hypothes.is implements early variants of those soon-to-be-formalized annotation standards, I’ve been able to do lots of useful integration work. 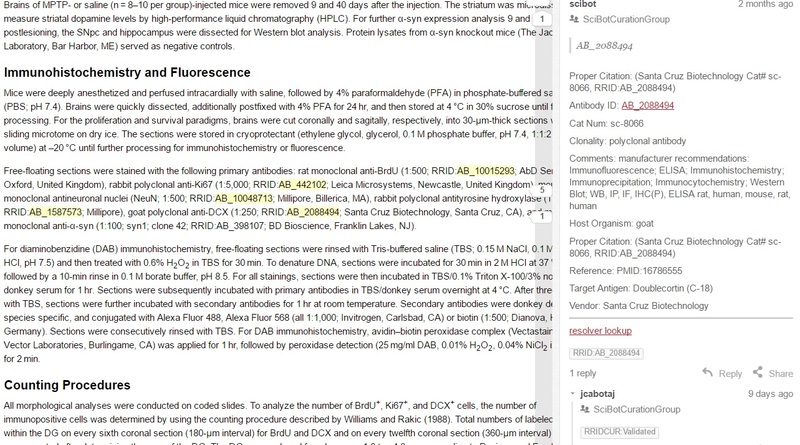 Much of it entails querying our service for annotation data and then filtering, transforming, or cross-linking it. That requires only basic web data wrangling. Some of the work entails injection of that data into web pages. That requires only basic web app development. But until recently I didn’t see a way to democratize the ability to extend the Hypothes.is client. Here’s a example of the kind of thing I want to be able to do and, more importantly, that I want others to be able to do. Like other social systems we offer tags as a principal way to organize data sets. In Hypothes.is you can use tags to keep track of documents as well as annotations linked to those documents. The tags are freeform. We remember and prompt with the tags you’ve used recently, but there are no rules, you can make up whatever tags you want. That’s great for casual use. If you need a bit more rigor, it’s possible to agree with your collaborators on a restricted set of tags that define key facets of the data you jointly create. But pretty soon you find yourself wishing for more control. You want to define specific lists of terms available in specific contexts for specific purposes. With any web-based technology there’s always a way to get your foot in the door. In this case, I found a way to hook into ngTagsInput at the point where it asks for a list of terms to fill its picklist. In the Hypothes.is client, that list is kept locally in your browser and contains the tags you’ve used recently. It only required minor surgery to redirect ngTagsInput to a web-based list. That delivered two benefits. The list was controlled, so there was no way to create an invalid tag. And it was shared, so you could synchronize a group on the same list of controlled tags. 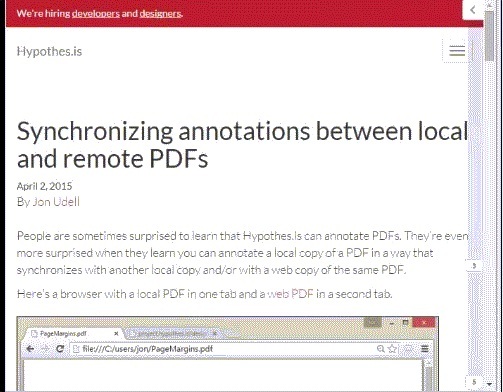 So, channeling Douglas Hofstadter, I wondered: “What’s the LTI of annotation?” The answer I came up with, in another prototype, was a way to embed a simple web application in the body of an annotation. Just as my LTI app is launched in the context of a Canvas course, with knowledge of the students and resources in that course as well as API access to both Canvas and to the global network of people and information, so with this little web app. It’s launched in the context of an annotation, with knowledge of the properties of that annotation (document URL, quote, comment, replies, tags) and with API access to both Hypothes.is and to the same global network of people and information. Just as my LTI app requires only basic web development knowledge and ability, so with this annotation app. You don’t need to be an expert to create something useful in this environment. And the thing you do could transfer to another standards-based annotation environment. Meanwhile Web client apps, in fierce competition with one another and with native mobile apps, will continue to require elite developers who commit to non-portable frameworks. Fair enough. But that doesn’t mean we have to lock out the much larger population of workaday developers who command basic web development skills and can use them to create useful software that works everywhere. We once called Perl the duct tape of the Internet. With a little knowledge of it, you could do a lot. It’s easy to regard that as an era of lost innocence. But a little knowledge of our current flavors of duct tape can still enable many of us to do a lot, if systems are built to allow and encourage that. The LTI ecosystem does. Will the annotation ecosystem follow suit?